OUTER APPERANCE: Leopard 48 has a spacious front cockpit that provides direct access to the saloon, which is a unique solution offered on Leopard yachts. The outer appearance of this catamaran is also characterized by a large aft cockpit with a table. The raised wheelhouse provides excellent panoramic view, thanks to which you can perfectly maneuver in the sea. INTERIOR: The interior of the Leopard 48 catamaran is not only beautiful, but also practical. The caboose is equipped with the best-in-class equipment, provides a spacious place for preparing meals and many other amenities. This catamaran also offers plenty of space inside. The luxurious interior makes sailing not only great fun, but also very comfortable. Its modern line and open developments have set new standards for modern motor-driven catamarans. 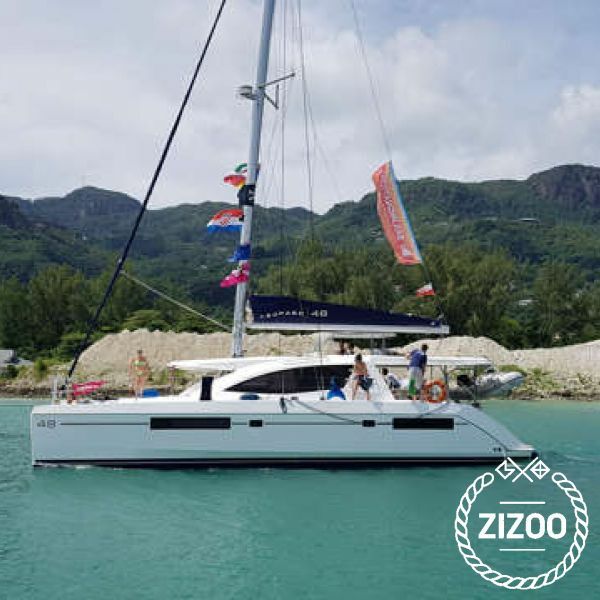 Discover the pristine beauty of Seychelles on a yacht charter holiday with Zizoo. Cruise along the crystal clear waters of the Indian Ocean while making stops to relax on white sandy beaches and explore the island chain’s fascinating cultural, natural and historic sites, including Arulmigu Navasakti Vinayagar Temple in Victoria and the Morne Seychellois National Park. Requested 21 times this week!